Roads are the hallmark of a progressive society and have profound impacts on the communities they serve. 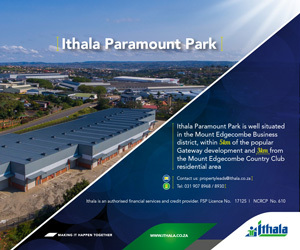 The almost complete Mount Edgecombe N2/M41 Interchange at uMhlanga on KwaZulu-Natal’s rapidly expanding North Coast, is one such development that will have a significant impact on this area’s urban quality and spatial connectivity. Drivers and commuters in the Mt Edgecombe area will have noticed a significant improvement in traffic flow since the upgraded 4-lane Flanders Drive M41 Bridge has been opened. With people today living longer and opting for a more active lifestyle, when planning for their future retirement many have no desire to spend their latter years in a typical old age home but prefer a far more independent and active lifestyle – all within a secure location and with medical facilities readily available.